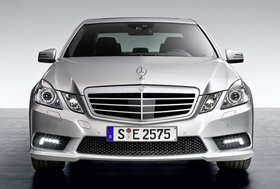 U.S. sales of the Mercedes E-class more than doubled to 27,778 in the first half. (Bloomberg) – Daimler AG's Mercedes-Benz may take over the top position among luxury brands in the United States after a decade of dominance by Toyota Motor Corp.'s Lexus. The Japanese carmaker has been marred by record recalls this year for flaws across its lineup. In the first half of this year, U.S. deliveries of Lexus models grew 19 percent to 107,430, while Mercedes-Benz jumped 25 percent to 106,972. Lexus's market share may dip to 1.98 percent this year from 2.1 percent in 2009, falling behind both Mercedes-Benz and BMG AG, according to auto-industry researcher Edmunds.com. BMW, the world's top-selling luxury auto brand, sold 100,632 units this year through June in the U.S. market. Problems including fuel leaks, engines that may stall and vehicles at risk of rolling over during emergency driving maneuvers surfaced after Toyota had already recalled more than 8 million vehicles under its main brand for defects linked to unintended acceleration. Jessica Caldwell, a senior analyst at Santa Monica, California,-based Edmunds.com, said Lexus, Mercedes and BMW are "really neck and neck” in the U.S.
“There is a big opportunity there for the Germans,” she added. Lexus's U.S. sales growth dropped to 2.7 percent in June while Mercedes-Benz, the second-biggest premium vehicle line globally, posted a 25 percent gain and BMW delivered 15 percent more cars. The German brands are also benefiting from a higher rate of leasing among U.S. customers than Lexus, Truecar.com's Toprak said. More than 60 percent of Mercedes-Benz vehicles are leased, compared with less than 30 percent of Lexus vehicles, he said. Mercedes C-class cars, the brand's top-seller in the U.S. and a competitor to the Lexus ES sedan, have been “particularly well received” this year, said Jim Hossack, an industry analyst at researcher AutoPacific Inc. in Tustin, California. Sales of Mercedes's E-class sedan, introduced last year, more than doubled to 27,778 in the first half compared with a year earlier. BMW this year revamped its 5-series sedans, which compete with Mercedes E class and the Lexus GS, as the Japanese brand works to fix an engine flaw that's affected its model. In the first half of 2009, Lexus appeared poised to fall behind BMW in the United States, with sales of 90,060 compared with BMW's 93,563. Lexus ended the year with a 19,473-unit lead over BMW, retaining its sales crown for the 10th straight year.